The Star A326 portable water quality meter measures pH and dissolved oxygen, automatically accepting of Orion polarographic and RDO optical/luminescence-based probes. DO results are guaranteed to be accurate due to automatic temperature, manual salinity and automatic/manual barometric pressure correction. DO calibrations can be carried out using water-saturated air, air-saturated water, a Winkler titration or zero point calibration. 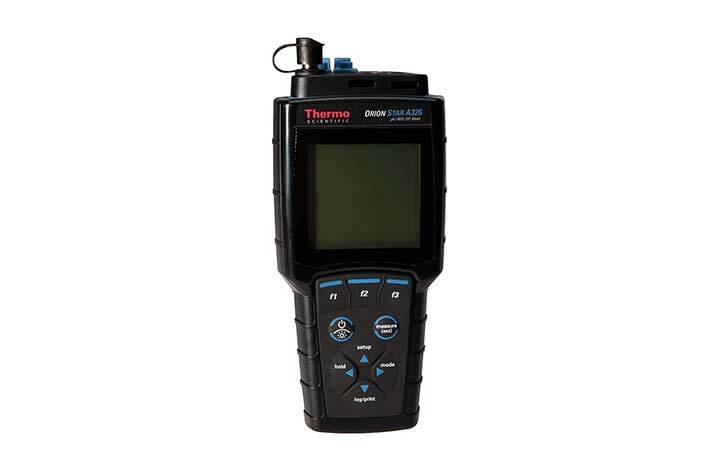 Up to 5 point pH calibration with automatic recognition for USA/NIST and DIN buffers and the advanced feature of being able to fix pH calibration errors using calibration editing without the need for a complete recalibration makes for easy use. Transfer of data and updated software is easily accessed using the USB and RS232 ports and data analysis software. The large backlit graphic LCD displays individual pH/mV/RmV or dissolved oxygen in percent saturation or concentration results with temperature, or all the results can be viewed at once. Laboratory results are given with stability and averaging options which allow further options for enhanced accuracy. 5000 data points time and date stamped can be held in the memory. Standard features of the Orion Star A326 pH/RDO/Dissolved Portable Meter are it is fully waterproof, housed with IP67-rated housing. It has Multilanguage settings in English, Spanish, French, Italian, German and Chinese and plain language prompts. AUTO-READ™ means readings will never be missed with the additional benefit of stable readings being locked on screen and an indicator alert highlight when readings are stable. Timed data allows readings to be gathered at timed intervals. The final benefits of this piece of equipment are it can be powered either by batteries which give up to 800 hours of operation of by a universal power adapter sold separately to use AC power and is covered by a 3 year replacement warranty.